When your monkeys won’t go to bed, you’ll have to use lots of tricks to make them sleepy! 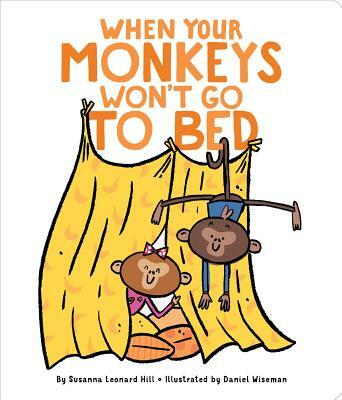 This charming and hilarious board book highlights the many ways to tire out two wide-awake monkeys! Do your monkeys go wild at bedtime? When your monkeys won’t go to bed, you’ll have to be smart. After you race them upstairs and trick them into the tub, it’s time to convince them to get into bed. Let them pick out a good book—or five—and snuggle in close. But be careful…or you just might fall asleep, too! Daniel Wiseman likes to draw. A lot. He likes it so much, he’s made a career out of it. Usually he draws animals wearing clothes, or kids enjoying a good dance party. However, when prodded, he’s been known to draw pretty much anything else. Daniel currently lives in St. Louis, Missouri, with his beautiful wife and his equally beautiful son. When he isn’t drawing, he can usually be found doing one of these great things: perfecting his biscuit recipe, hiking up a mountain in some faraway location, singing loudly in his car, riding his bike on the mean streets of STL, or napping.